The following comes from a book by Jim Rohn and I think it includes some great thoughts for coaches, players and people in general. A big part of who we comes from those in our circle of influence. How much time to you spend checking on your circle of influence -- evaluating what they are giving you in the way of influence? Do you actively spend time recruiting people to your circle with the thought that they can help you grow professionally and personally? Question #1: Who am I around? It pays to take a survey once in a while of those people who touch our lives on a daily basis and to mentally weigh the effect these members of our inner circle might be having on us. What reputation do they have with those who are productive, knowledgeable and respectful? What is the level of their own past accomplishments? What is the depth of their knowledge? Do they understand the value and importance of attitude, goals and personal development? Those who can reach us and affect us on a daily basis should inspire us, not spread the seeds of doubt and dissent with their pessimism, complaining and ridicule of others. Maintaining a positive attitude in the face of life’s challenges is difficult enough without this kind of influence in our lives. Question #2: What effect are they having? That’s a legitimate question. Where do they have us going? How have they got us talking? What have they got us thinking, reading and doing? What influence are they having on our ability to perform well and to grow, and to feel good about what we are doing? Most important of all—what do they have us becoming? It is easy to let the wrong people slip into our lives. That is why we must take a close look at this circle of influence. In an effort to protect ourselves from the wrong influences, we may be forced to walk away from people we have known for many years in order to develop more positive and motivating friendships. Question #3: Is that acceptable? Sometimes it is helpful to remember that it is not just our attitude that we are attempting to protect and nurture, but the future well-being of others as well. If we are strong, we can help others to change and to improve their lives. In order to protect our better future we must have the courage to disassociate whenever necessary. That may not be an easy choice, but it may be a necessary one. Like failure, influence is subtle. We would never allow someone to deliberately push us off the course we have set for ourselves. But if we are not careful, we might inadvertently permit someone to nudge us in the wrong direction a little each day. Disassociation is not something to be treated lightly. It must be done carefully and thoughtfully. But if we are sincere about changing ourselves and designing a better future, we are obligated to distance ourselves from those who are having the wrong effect on us. The price of not doing it is simply too enormous. 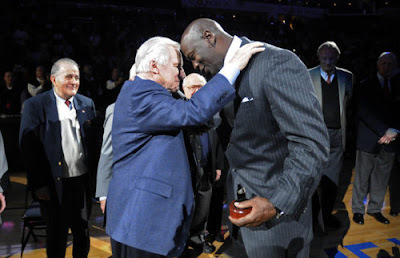 "Coach Smith seldom talked about winning. Instead he talked about the things we needed to do to be successful. He never got too high after winning or too low after a loss. He taled to us about what we did well and what did poorly, regardless of the outcome of the game." Of course no one was more important to Carolina basketball than our former players. They made the program. Nothing made us fell better than for them to come back and visit, or scrimmage against our current players in the summer, or work out with them. There was no generation gap between our former and current players. They were brothers linked by tradition, by the color light blue. I didn't begin my coaching career with the goal of staying in touch with the former players, but I sent each one a media guide each year and wrote each a personal note at Christmas. If you develop a close relationship with a player, as we did, you don't drop it just because the player's eligibility is up. You don't forget them. I wanted to stay in touch, and I'm always pleased, thrilled, and interested when our former players let me know what's going on in their lives. 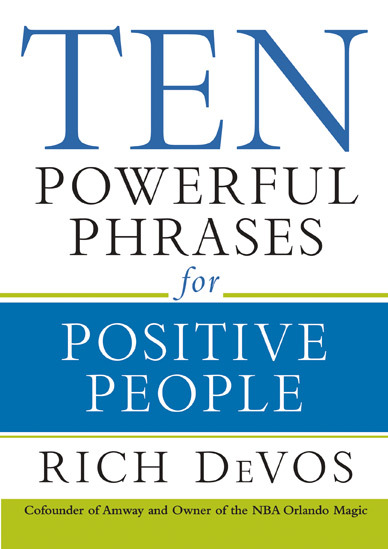 10 MOST POWERFUL PHRASES: #6 "THANK YOU"
I recently picked up "Ten Powerful Phrases for Positive People" by Rich DeVos who is the cofounder of Amway and the Chairman of the Orlando Magic. It's not a big book but it was a great read. There is no one this book would not benefit, especially coaches. This is a relationship-improvement book whether it's your professional life or your personal life. I will share some of these words and the thoughts but DeVos gives so many great stories that I strongly recommend you get the book. "Thank you" is an acknowledgement of the other person's generosity. It recognizes the other person's kindness and the effort that person made to think of us. "Thank you" says we appreciate a job well done and the time someone devoted to develop his or her talents to perform for us to provide a skilled service. Saying thank you and gestures of thanks are expressions of our love or kind thoughts about an individual. Whenever we give even a small gift, the saying really is true that "it's the thought that counts." But what's most important is that we put our thoughts into action with a gesture: a card, a gift, or any expression of "Thank you. I appreciate you. You do good work and that help me." Just feeling thankful does nothing to demonstrate our gratitude. Too often, we think about saying thanks but somehow don't get around to take the time. We're often too slow to give thanks and too quick to complain. Maybe we're so focused on ourselves and busy with our lives that we forget to say thanks. Now read "how to be a loser:"
Take it day by day. Don’t bother with setting goals, making plans and preparing. Just wake up each morning and figure out what you want to do then. Seek comfort. Growth and progress requires work, stress and struggle. Forget it. Stay comfy instead. Don’t believe in anything. It’s easier to be cynical. If you believe in something you’ll have to do something. It’s easier to point out what’s wrong with something. Then you’re off the hook. Be heard. You have a voice—use it often. Be sure to tell your story, no matter who is talking and what the topic is. Avoid failure. The best way to avoid pain, rejection and failure is to not try at all. Sleep in. Hey, you don’t want to accomplish much anyway, you might as well sleep in. Let the early morning strivers clear out before waking. Don’t let others mess you up. Just take care of No. 1. Family, friends and other relationship require effort, sacrifice, being inconvenienced and doing things and listening to things you don’t want to. Who needs that? Be blameless. If you never step forward and take responsibility, then you can never be blamed. Defend yourself. Your view and opinion should be protected in every instance. Don’t let something you disagree with go undefended. Prove yourself always. Protect yourself. Keep your guard up. Trust no one. Love no one. Those you let in might hurt you. Keep a wall around your heart. It’s safer that way. Expect to lose. If you expect it, you can’t be disappointed right? Don’t put yourself at risk by having high expectations. Expecting to win and for good things to happen puts pressure on you and makes you face self-doubt, angst and tension. Just surrender early. Then the pressure is off. For extended study… just find two or three losers and interview them. Find out what TV shows they watch, what radio programs they listen to. Find out where they eat and what they eat. Who do they spend time with? What do they talk about? What magazines, books, blogs and newspapers do they read? Find out what they think about our current economy, our government and the future. Ask them how they treat their spouse. Find out what they think about their co-workers. Etc. Take copious notes. Make a long list. Then, DON’T DO ANY OF THOSE THINGS! Those are the things that mess up your life. Do the opposite and you become the opposite of a loser, which is a what? Yeah, a winner! That’s what you want to be, right? Then don’t think, act, talk, walk, dress or do what losers do. 1. Our System of play is tailored to fit the skills and attributes of our individual players, as opposed to trying to plug our players into roles that are convenient, but do not fit them. 2. The foundation of our program, like all championship teams, is our defense. Therefore, everything we do centers around our team becoming great defensively (D-2 Key Result Area). 3. Our Strength Program is a major factor in our physical development, and another resource that we utilize to gain the “Winning Edge” (D-2 Key Result Area). 4. 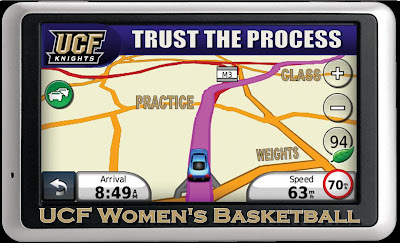 We have had the following programs visit us in the past 18 months to obtain a deeper understanding of our winning offensive and defensive philosophies: Wake Forest, Xavier, St. Bonaventure, Augusta State, Wright State, Winthrop, Lander, University of Tennessee Women and Presbyterian College to name a few. We are committed toward building positive relationships with each of the young men in our program. We feel very strongly that the relationship we develop with our student-athletes is the very fabric of our success. And without relationship, the chances of achieving success decrease dramatically. Excellence is a process: winning and losing are just points of reference along that continuum. 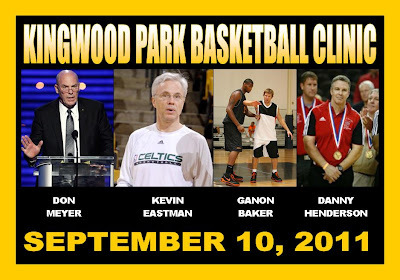 A reminder about the annual Kingwood Park Basketball Clinic which is just around the corner and will be held on September 10, 2011 at the Kingwood Park Competition Gym. It will be complete with players for demonstration. "It's not the disability that defines you, it's how you deal with the challenges the disability presents you with. We have an obligation to the abilities we DO have, not the disability." 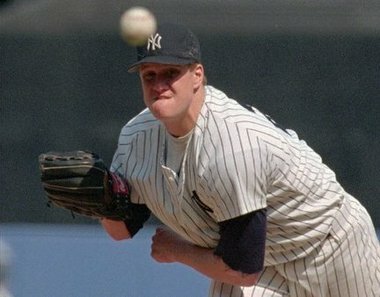 Jim Abbott was born September 19, 1967, in Flint, Michigan without a right hand. He was an All-America hurler at Michigan; won the Sullivan Award in 1987; was the pitcher for the Gold Medal Olympic Team in 1988; and threw a 4-0 no-hitter for the New York Yankees versus Cleveland (September 4, 1993). Jim played for 10 seasons on 4 different teams and ended his big league playing career in 1999. Abbott has worked with The Department of Labor's Office of Disability Employment Policy (ODEP) on several initiatives encouraging businesses to hire people with disabilities. Today, in addition to often being a Guest Pitching Instructor during Spring Training for the Los Angeles Angels, Jim Abbott is a motivational speaker. Our struggle to put first things first can be characterized by the contrast between two powerful tools that direct us: the clock and the compass. The clock represents our commitments, appointments, schedules, goals, activities -- what we do with, and how we manager our time. The compass represents our vision, values, principles, mission conscience, direction -- what we feel is important and how we lead our lives. 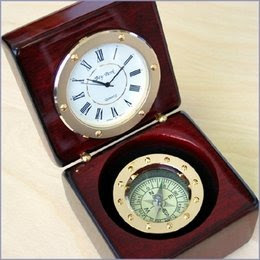 The struggle comes when we sense a gap between the clock and the compass -- when what we do doesn't contribute to what is most important in our lives. 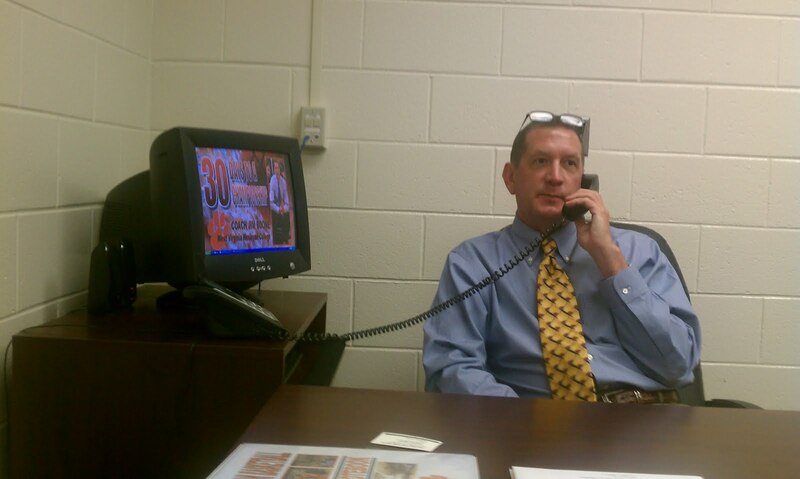 Besides blogging in his "30 Days To A Championship," new West Virginia Wesleyan head coach Jim Boone will also be tweeting as he goes through the process of laying the foundation for a new program. We will copy and paste some of these tweets here every few days in case you missed or are not on twitter. Jim will be utilizing the hashtag #30DC to donate all tweets in this process. When an athlete keeps repeating the same mistakes, the coach should see the "red flag" of someone whose mental game is deficient. Going back to the drawing board will not stop that flag from being waved. Xs and Os are part of the analytical aspect of preparation. The human aspect must not be neglected. The teacher-coach may know his subject but he'd better know his student-athlete. Asking probing, encouraging, motivating, clarifying, reiterating, reinforcing, disciplining: the coach helps enhance the athlete's mental game through the use of these approached and responses. Jim Boone: My first day on the job I made time to make some recruiting calls. And I have done the same thing each and every day since. Recruiting is the lifeblood of your program. It is not an exact science but you have to be very detailed in your approach to try and make the absolute best decisions you can make for the overall benefit of your program and your institution. Everything you do with your program should have an eye on recruiting. Everything from how I decorate my office & our locker room, the stationary we design, the way we play offensively and defensively, the people we surround ourselves in our program with -- everything! It is important, in my opinion to utilize every from of communication available to you within the NCAA's guidelines. That's why I have been writing notes, typing emails and dialing phone calls. I want to talk obviously to the student-athlete but also to members of his family as well as his coach. It is important that they all get an opportunity to know me and my philosophy but it is critical that I get to know all of them. • Talk more about the other person and less about yourself. Prepare two or three questions you can ask someone before a meeting or social gathering. • Give something of value, such as a helpful quote, story, book, or CD, to give to someone when you get together. 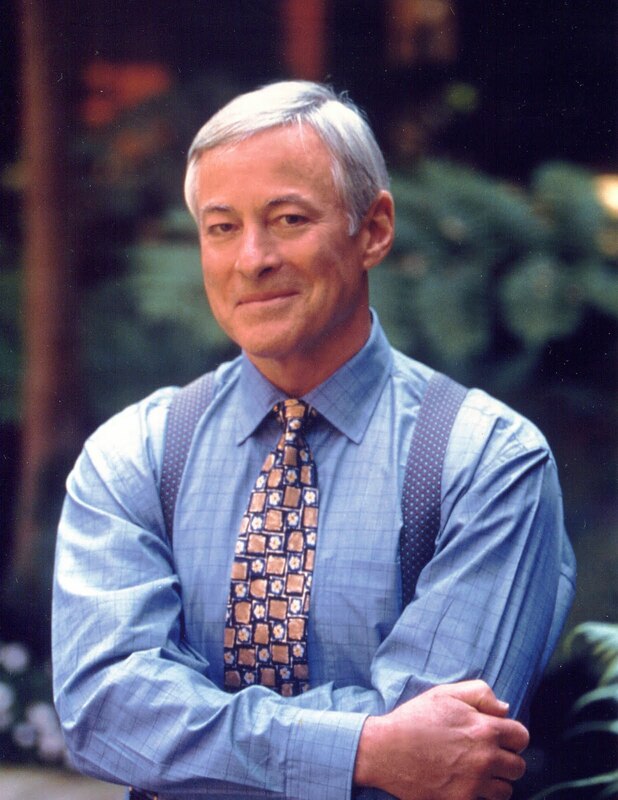 • At the close of a conversation, ask if there is anything you can do to help them and then follow through. Acts of servanthood have a resounding impact that live longer than words. Telling a secret is easy. Keeping one is hard. Fall is easy. Getting up is hard. Eating is easy. Dieting is hard. Going to the glass is easy. Blocking out is hard. Argument is easy. Negotiation is hard. Posting up is easy. Holding the seal is hard. Naughty is easy. Nice is hard. Dumb is easy. Smart is hard. Cutting off a screen is easy. Shoulder to shoulder is hard. Sarcasm is easy. Sincerity is hard. Defending the ball is easy. Getting a hand up on the shot is hard. Growing weeds is easy. Growing flowers is hard. Reaction is easy. Action is hard. Feasting is easy. Fasting is hard. 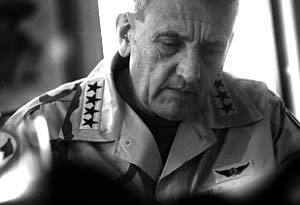 I love the way retired Army general Tommy Franks has disciplined himself to look at intangibles and get ready for them. 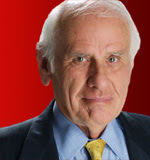 Every day of his career since February 23, 1988, he has approached his work day by looking ahead. In the morning, he places a blank three-by-five card near his calendar and writes on one side of it the date and the words “The biggest challenges I may face today.” Beneath it he writes the five most important problems he might face. On the back of the card, he writes, “Opportunities that may appear today,” and lists those. I was going over some Coach Don Meyer notes this morning and read this one and thought it profound. It is great insight as to how you get from good to great. 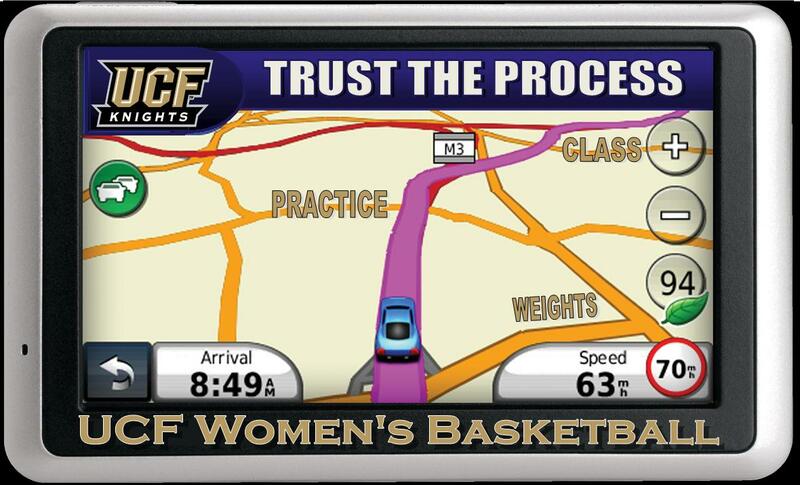 You can never be satisfied with success if you are process-oriented. For Coach Meyer, the goal wasn't to win the next game -- it was for his team to be the best they could be. 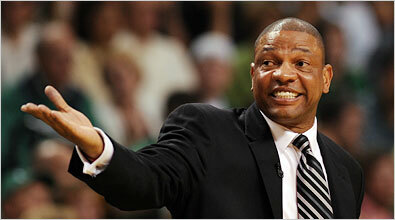 He knew that a win could be just as detrimental to his team as a loss if it was handled correctly. You can also see that he immediately let go of the victory and began focusing on the next part of the process -- having a good practice the next day. This is a great mindset for champion. we averaged 33 wins per seasons. When you lose trust by making people feel disrespected, people give themselves permission to question your character and motives. Honesty is not the issue. You can be honest and lose trust. Not only do they judge your character, they feel justified, even compelled, to “warn” others about you. You can’t be trusted. People trust you when they feel respected by you. When they feel disrespected, however, they are disrespected. Perception is reality. 1.Rushed exchanges. You don’t have time for them. 2.Unilateral decisions. Lack of participation in decisions that directly impact them. 3.Poor listening. They don’t feel understood. 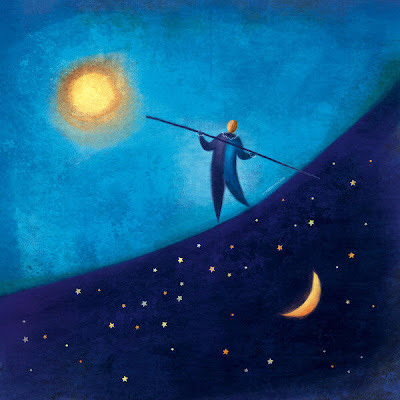 6.Emphasizing failure as a tool to motivate forward momentum. 8.Cutting them off when they’re speaking. 10. Watching your computer while talking. 1.The opposites of the list above. 3.Gently, clearly tell it like it is, even when they disagree. 4.Appreciate their skills and talents. 6.Admire their contribution and accomplishments. 9.Acknowledge their challenges and struggles. 10. Hold phone calls and other communications while they’re speaking. Read the entire post at: http://bit.ly/o3PBXR (and check out the rest of his post while you are there -- it will be worth the time. Jim Boone: We will spend the morning working with Compliance - new hire in that department, Alison Clauson is doing an outstanding job - working to get all players certified & on the court. Today I will also meet with our Training Staff to educate them on my philosophy & expectations as well as to learn and understand theirs - communication and cooperation between a coaching staff and a training staff are critically important for the welfare of the student-athletes. It is also a big day as well we have assistant coaching candidate on campus for interviews. And finally, we have some strength testing with our team where we will focus on upper body - Bench, Pull-ups, 185 lb Max Test - Big Day! BEST DEFENSE -- ALL IN! Excellent Concept: "the body and the mind doesn't have to be at the same place on defense." To begin our individual workouts we discussed "process oriented thinking" vs "results oriented thinking". This battle between "process" and "results" is a constant battle for coaches and players, because we live and work in a result oriented society and work in a result oriented industry. To make our teaching point, we used the analogy of a GPS. We empasize the next best action. Just as a GPS gives "turn by turn" directions, one at a time, to lead you to a destination. In our team meeting we set our Vision and Goals for the pre-season, non-conference and season. However, we must focus on the "turn by turn" process to reach our "destination". Life, just as in driving, offers detours and many times we have to "recalculate", re-route and continue the process to our destination. Some times these detours are because of choices we make, clutter that we allow to interfere with our process and often the detours result from things outside our control. Dysfunction 1: Absence of TrustIn the context of building a team, trust is in the confidence among team members that their peers’ intentions are good, and that there is no reason to be protective or careful around the group. In essence, teammates must get comfortable being vulnerable with one another. All great relationships, the ones that last over time, require productive conflict in order to grow. This is true in marriage, parenthood, friendship and certainly businesses. It is important to distinguish productive ideological conflict from destructive fighting and interpersonal politics. Great teams understand the danger of seeking consensus, and find ways to achieve buy-in even when complete agreement is impossible. They understand that reasonable human beings do not need to get their way in order to support a decision, but only need to know that their opinions have been heard and considered. Great teams ensure that everyone’s ideas are genuinely considered which then creates a willingness to rally around whatever decision is ultimately made by the group. The essence of this dysfunction is the unwillingness of team members to tolerate the interpersonal discomfort that accompanies calling a peer on his or her behavior and the more general tendency to avoid difficult conversations. Members of great teams overcome these natural inclinations, opting instead to “enter the danger” with one another. When we started winning championships, there was an understanding among all twelve players about what our roles were. We knew our responsibilities and we knew our capabilities. And that’s why we were able to beat more talented teams. 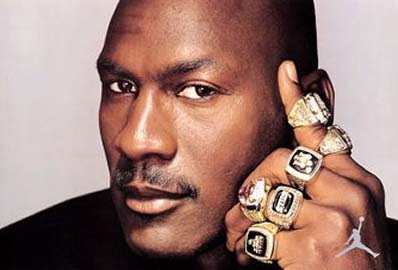 There are plenty of teams in every sport that have great players and never win titles. Most of the time, those players aren’t willing to sacrifice for the greater good of the team. The funny thing is, in the end, their unwillingness to sacrifice only makes individual goals more difficult to achieve. The minute you get away from fundamentals, the bottom can fall out. Fundamentals were the most crucial part of my game in the NBA. Everything I did, everything I achieved, can be traced back to the way I approached the fundamentals and how I applied them to my abilities. They really are the basic building blocks or principles that make everything work. I don’t care what you’re doing or what you’re trying to accomplish; you can’t skip fundamentals if you want to be the best. You have to monitor your fundamentals constantly because the only thing that changes will be your attention to them. The fundamentals will never change. It comes down to a very simple saying: There is a right way and a wrong way to do things. You can practice shooting eight hours a day, but if your technique is wrong, then all you become is very good at shooting the wrong way. If you don’t back it up with performance and hard work, talking doesn’t mean a thing. Jim Boone: Today will be a day that I will spend entirely on campus again with lots of important things going on as we move forward trying to develop a culture. The player meetings are on-going and important. Building trust in each other is not a one-time event -- it is forever evolving. I can tell you this -- the more I meet with them the more I'm loving my new team! 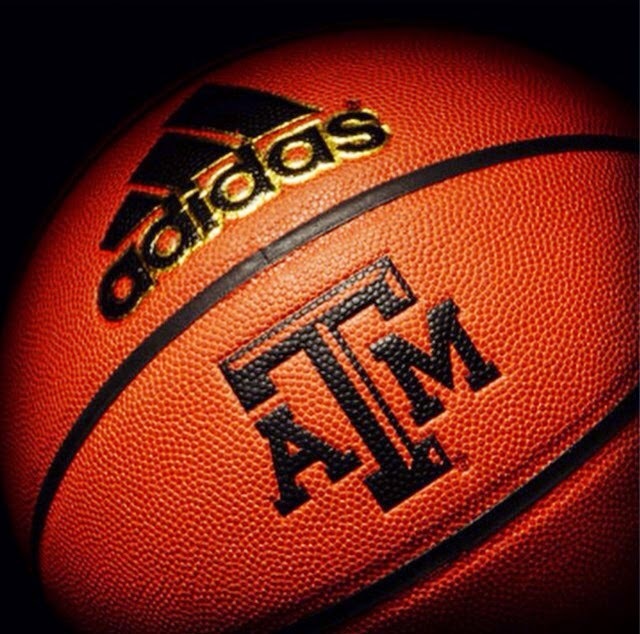 I will also take some time to start putting together our pre-season workouts...finally some basketball X&O's! And then I am working to finish up interviews for our staff positions -- this is a tough process. It's such a critical hire. You want to get the staff on board as quickly as possible but you can't rush the process to hire the right people. 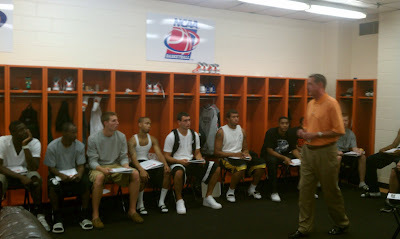 Thanks to Coach Jim Boone for sharing the notes he read from during his first team meeting at West Virginia Wesleyan today! Overriding Purpose is Team AttitudeEverything we do should be TEAM FIRST! You are Your Brothers Keeper! Seniors are responsible for the team, but everyone must be their own captain. Boys to men, we must have men. Those who work the hardest, smartest, and together never surrender! Freshmen will be home sick, don’t use this as an excuse to fail! Elite Hoops Basketball is excited to host the Elite Hoops Basketball Clinic at DeMatha Catholic High School on Saturday, September 10, 2011. Come out and hear from the 4 newest college coaches in the DMV, representing the ACC, CAA, and the Atlantic 10, as they share their respective plans and basketball knowledge with you. You will also hear from the DeMatha Coaching Staff as they approach this season. Early bird discount and group rates are available. Don’t miss out on this tremendous opportunity. Get a jumpstart on your winter season by learning from the BEST!!! We look forward to seeing you on the 10th!!! Pat Skerry is known as one of the best up and coming Division 1 coaches in the USA. He was named the new Head Coach at Towson University on April 5, 2011 and is ready to bring the Tigers to the top of the CAA. He has coached for 19 years, including time at Pitt, Providence and Rhode Island, before arriving at Towson. Mike Lonergan is a DMV native and former National Championship coach at Catholic University. He led Vermont for the past 6 seasons to be one of the most successful mid-major programs in the USA. He has a career record of 377-156. And is primed to lead GWU to the top of the A-10. Mark Turgeon comes to College Park after leading Texas A&M to 4 straight NCAA Tourneys and at least 24 wins in each season. Before that, he was the Head Coach at Wichita State and led them to 4 straight post-season appearances. Coach Turgeon was the Big 12 Coach of the Year in 2010 and 2011. Paul Hewitt arrives at GMU after successful stints at both Siena and Georgia Tech. 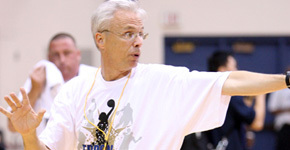 Coach Hewitt has coached in the Final Four, has coached numerous NBA players and is widely considered as one of the top coaches in America. He brings his impressive resume to a very talented Mason program. Mike Jones is entering his 10th year as the Head Coach at DeMatha. He has led his teams to 6 of the last 7 WCAC Titles as well as the DC City Championship. He has a career record of 241-62. 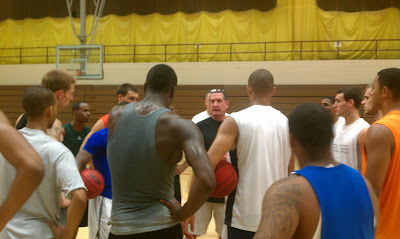 Since taking over the program, his staff has sent over 50 players on to play college basketball. HOW MANY HUDDLE SITUATIONS DO YOU HAVE? At this year's Coaching U Live, Doc Rivers of the Boston Celtics started off by telling us of a conversation he had with Bill Belichick of the New England Patriots. Belichek had told him he couldn't coach basketball because he didn't like the lack of control you had offensive and defensively. He said he hated that there wasn't any stoppage of the action to control possessions. Doc tried to explain to him that you could. Doc said they had charted possessions for Boston and that they averaged 92 to 93 possessions a game. When you add up free throw situations, timeouts, dead balls and end of quarters, you had "more huddle situations than you think." Doc's challenge was what do you do with your "huddle situations?" 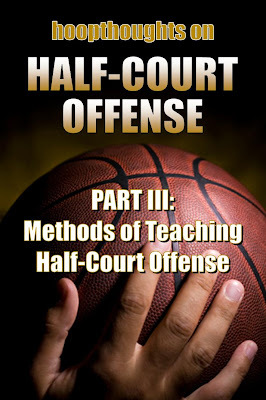 In the second part of our series we talked about the key components that go in to the making of a good half-court offense. If you missed that post, you can re-read it here: http://bit.ly/p5bCOe. Today we want to talk about how to teach good half-court offense. Though years of coaching and, more importantly, watching some of the best teach in their programs, I have noticed a few common denominators. My first recommendation for being a better half-court offensive team is to create better players. Never minimize the importance of individual player development along with the need to teach and maintain the fundamentals of the game. 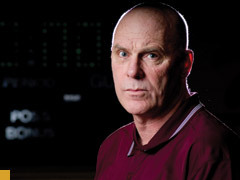 Coach Don Meyer would always ask, "When the playoffs come around, would you rather have better plays or better players?" The logical answer is better players. However, I think the goal should be to have both. Developing players to become better can only enhance everything you do -- including half-court offense. There are several ways to go about it. The one that has been most successful for me is the "Pre-Practice" period. Everyday before practice, we are going to breakdown between 20 and 30 minutes and work on individual development. This would include everything from ball handling, dribble passing, cutting, screen and shooting along with defensive fundamentals. The Pre-Practice segment forces us to think in terms of breakdown everyday which is important when you get into February. We like to cut practices back a little bit but we still find time for our Pre-Practice session. The next phase is to break down the important parts of your offense or plays and develop them for maximum execution. If were a Flex coach, I'd run some 3/0 and 3/3 Flex drills everyday. If I were a UCLA High Post coach I'd break down the initial UCLA cut and also the duck-in action on the high post feed. If I utilized ball screens, I would break them down into parts to work on technique and execution. If I ran set plays, I'd take a part out of the play that I thought was the primary scoring option and work to improve our performance in that area. 1. What do you want us to do? 2. How to you want us to do it? All three are important in terms of having a good breakdown series but "why" might be the most important in terms of having success when you carry it over to whole method. Whether you are part or whole method, there are good reasons for working on your offense against no defense as well as against defense. Working against no defense allows you to have better concentration on timing and technique and I think it is an important part of developing offense. Of course, running offense against defense brings recognition into play and that is critically important as well. There is a time and place to do both. Some coaches spend too much time running half-court offense from a dead ball situation. Even worse, starting the ball "up top" and running sets. These teams may execute well in that environment but they will struggle with a defense the picks them up high and pressure the ball and entry passes. Spend time "flowing" into your offense -- a lot of time -- actually the majority of your time. We have been believers of starting at 3/4 court and then having two conversions when working on half-court offense. It allows us more of a game situation along with working on transition components. When you work on your inbounds offense or sideout sets, let the team flow into your half-court offense if they don't score of the special situation play and then let them convert one time. These are big part of teaching motion offense but they can really help develop any offense you run. Restrictions are how we dictate the thought process in our offense. For instance, if we aren't reversing the ball enough in our offense, we will tell our team, "two reversals before a jump shot." Now with our restrictions, we all them off for a lay-up. No matter what we call, if a we can cut or drive directly to the rim, we are going to allow it. Maybe you want a better inside presence. "We need two low post touches before anyone shoots a jump shot." This tells your post players they better get to work and lets your perimeter players know they better be looking inside. Maybe you have a special player. At LSU, in practice (and sometimes in games) we would instruct our team, "Seimone gets two touches before anyone shoots." This tells Seimone she has to work to get get open -- post up, space out and utilize screens. It tells the rest of the team that they better screen for her and get her the touch when she is open. Of course video is important -- players today are such visual learners. Make sure you watch video of your team from practice as well as games. And I think it is very important that they see clips of proper execution as much as possible. It is easy to show them failed possession -- and it is needed as well. Be make sure they see correct play as much as possible. We have even shown them clips of some of our previous teams executing well. And even shown them clips of another team, college and pro with good execution. 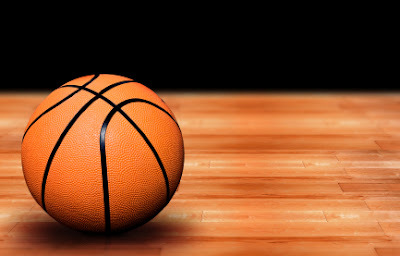 Finally, utilize stats as a way to help develop your half-court offense - and I'm not just talking about shot attempts, assists, offensive rebounds, etc. In motion, screening is important so we chart screens. Getting the ball inside is important so we utilize a post feed chart. The post feed tells us what post players are getting touches and which players aren't as well as which players are feeding the post and which players aren't. This gives you a lot of valuable information. Don't be afraid to use your imagination to develop a stat to bring attention to a needed area of your offense. 2/0 Back Cuts: show hands to the ball to set up cut, plant, straight cut to rim - finish!